I’ve been looking back at some work I did a couple of years ago on customer focus for a large government department to try to explain how a simple Pinpoint workshop works – I’m having trouble writing a case study (soooo boring) so I just thought I’d write it out here and see where that got me. I’d forgotten that the original brief was to find some different communication form for talking to as many people as possible within this department about “customer focus”. The perception (in grossly generalised terms) was that people were more focused on their given functional tasks and rarely questioned what value they were adding for the end users or customers or did anything to find out whether the service they provided was useful or met a customer need. So first of all I designed a Pinpoint workshop to run with a selection of senior managers from across the organisation (people who pretty much already got customer focus) to talk about this and what should be done. What does Customer Focus mean to us? What does Customer Focus mean to customers? How good is the Department at Customer Focus? What are the characteristics of excellent internal communication that would improve our Customer Focus? What communication products would improve the Customer Focus of the Department? I wish I could say I entirely planned it this way, but the way it turned out was that as well as understanding better what customer focus meant in this organisation, everyone said: “This is great, we should make this workshop into something that everyone can do”. Who are your customers? This warmed people up and got some of the stuff out of the way about differences of opinion on this subject – in government departments some civil servants still see ministers as their key customers! What does Customer Focus mean to you? People talked about feedback, communication, building relationships, responsive action. How well do you involve customers in what you do? Naturally some people felt better about this than others – depending on personal experience and the nature of their jobs. What does Customer Focus mean to your customers? Here people thought more about quality, responsiveness and meeting expectations. What more could we do to involve customers in what we do? This varied between teams depending on what their level of interaction with customers but it generally brought out high-level ideas about improving the quality and quantity of communication. Then depending on what ideas had come out of that, the group was split into two or three sub-groups to look in detail at what ideas they had about improving how they involved customers. This involved an ideas gallery session asking them to come up with Ideas, Barriers and Resources required. After creating these and discussing them, the team came up with an action plan for themselves (what to do, who would do it, by when, with help from whom). The team also had to come up with a contact to liaise with the customer focus team to let them know how they were getting on and where they needed further help. 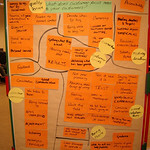 A better and shared understanding among the participants of what customer focus really meant.